Boating—both occupational and recreational—is popular along Washington’s coastline as well as on inland lakes. And for good reason: many people find the play of water and waves fascinating and enjoyable. At the same time, there is a dark side to boating: the constant risk of exposure, hypothermia, and drowning. The water is not a natural environment for humans. It’s all too easy to forget that a sudden storm, a mechanical failure, a collision with a dock or floating object, or some other mischance can suddenly put all passengers in deadly peril. Planning ahead can help avoid many accidents on the water, but it’s also important to be prepared when an unexpected accident occurs. In that circumstance, the safety equipment you have packed on board for emergencies can make the difference between life and death. 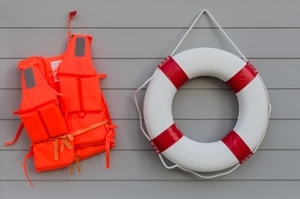 Our focus here is not just on rescue supplies if someone is swept overboard, but a broad list of supplies that can help you respond to a variety of emergency situations. Life vests for all crew and passengers. Non-swimmers and children should be required to wear their life jackets at all times. Electronic devices: spare cellphone, GPS device, VHF radio, and personal locator. These items should all be secured in a “dry box” safe from water leakage. Include extra batteries or power sources, too. Duplicate ship’s equipment. These items may be required if a collision damages your primary supplies. A spare propeller, a backup anchor and rope, and extra dock lines can be vital when your boat is disabled. An inflatable life raft. Optional, but a good idea if you have the storage space available. Of course, it will not do any good if your set of emergency supplies is packed away in an inaccessible location, or if you have not regularly inspected your supplies to make sure they’re still usable. Your flashlight won’t function if the batteries have failed after four years in storage. Your flotation devices won’t help in an emergency if their fabric and plastic became brittle and fell apart a decade ago. Maintaining a set of emergency supplies includes checking them for defects regularly—at least once a year. Boating injuries are common in the United States—more common than most people realize. While some of these injuries are due to pure chance, most are products of human error and recklessness. Drunken boating, operator inexperience, high speed, or violating navigational rules can all lead to tragic consequences. At the Andrew Kim Law Firm, we regularly talk to people just like you who have undergone boating accidents and injuries that should have been prevented. When someone acts in an unreasonable manner that causes you harm, you have the right to seek a fair recovery for your losses. If you call our boat accident attorney today, we can start working on making things right for you.